Orangeboy: tense, tough and powerful. 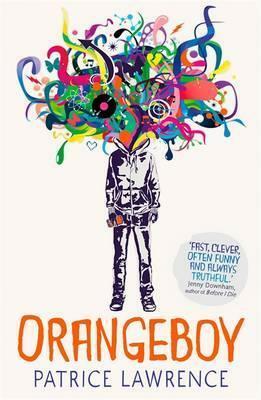 I have had Orangeboy on my watchlist (books that I want that I’ve not read) since UKYACX last year. I didn’t get round to buying it last year, but it was always in the back of my mind to read it and when Rachel announced that there was going to be a SundayYA chat about social class and that book was the focus I knew I had to read it. I like to be in the know, having read the books before we talk about them. I was tentative to pick it up, having bought it back in February. It just intimidated me, it’s pretty thick and it’s about some pretty DEEP issues. When I picked it up, I knew I had to be ready to read about these issues. Orangeboy is about Marlon, a young boy from London who ends up getting into the worst kind of trouble: gangs, drugs, death and revenge… he just happened to be in the wrong place at the wrong time. I liked Marlon. Initially I really liked him, but as the story went on he morphed and changed into a character who I didn’t like as much. I didn’t dislike him though. He changed but his essence remained. He loves his family, his brother and his mam are his concern. He’s stubborn and proud. His best friend Tish sees through him. She’s always there, looking out for him even when he’s being blind to the bad that he is heading into. She infuriated me at times, but like all good best friends she’s there for him. I really struggled with this book to start with. All the talk of drugs really bothered me. I texted a few friends asking whether I should persevere and I got a resounding yes from all of them. As I read however, the plot thickens, the characters get more complex, the issues become more real. I wanted to know what was going to happen. I wanted to know about Marlon’s relationship with his brother. I wanted to know whether he becomes the Marlon at the start of the book or not. And I am so glad I stuck with it. It’s a tough, hard-hitting book that I think everyone should read. It deals with real issues. It’s not an easy read. But it’s a necessary read. Plus the incredible infusion of music made it all the better. Have you guys read Orangeboy? Did you like Marlon? Or did you find him hard to like? Let me know on Twitter (@eenalol) or in the comments!